As you may have noticed, I haven’t posted anything new to the PnPG blog for while. Don’t worry, I’m still here! For the past few weeks, and the next few, I’ve been buried in real life with moving my family to a new home, one town over. During this transition, I’ve now got two homes to maintain and improve—the one we’re moving into, and the one we need to sell—so I’ve been working ’round the clock to minimize the necessary overlap time. I’d hoped to find time to make at least short blog posts once a week or so throughout the move, but I’ve just been too tired from too many consecutive 16-hour days to post. On the plus side, the new home is an upgrade in every way. It’s a bit bigger than the one we’ve been in for the past decade, the yard is larger and has some fantastic shade trees, and it’s in a better school district for my daughter. Most importantly—to you and me, if not to my wife!—it has a big, dry basement, which will allow me to set up a permanent nerd bunker, including an office, crafting bench, books and games library, and large gaming table. Having a dedicated gaming space has been a life-long dream, and its finally possible! This game room will also allow me to expand the game coverage in the blog, with space and facilities to better photograph or even video gameplay as well as crafting projects and tutorials. Once we get past this admittedly exhausting transition period, things here at PnPG should really bust loose! I’ll keep you posted as the game room develops, but I’m looking forward to a very gamey fall! 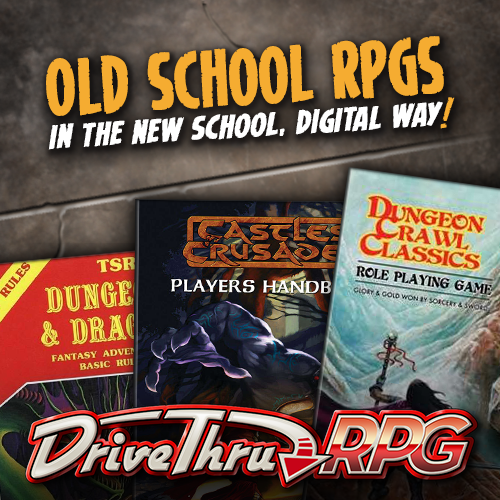 Every year, DriveThruRPG/RPGNow livens up the doldrums of summer with its big Christmas in July sale. During this event, literally thousands of titles, from hundreds of publishers, are discounted by 25%. Many of these products are not often discounted, so Christmas in July is a great opportunity to pick up some games and supplements that you’ve been waiting to buy. The sale ends on July 31, so don’t wait too long! Throughout what’s left of the Christmas in July sale, I’m going to share some items from my personal Christmas list: games, miniatures, and crafts that I’ve found especially useful, that aren’t often discounted. These won’t be full reviews—I don’t have time to write long profiles before the sale ends. Instead, I’ll stick to quick recommendations of some of my favorite books and games, ones that are even more valuable when you can get them for 25% off! A month ago, I teased PnPG’s first contest for blog readers—then I got buried with my move, and never followed up. Well, that contest is still going to happen, just not yet. I’ve got the prize packages in hand, but there’s no point in doing a big promotion during a period when I’m not able to blog regularly. Instead, I’m going to postpone the contest for a few more weeks, when my family will be settled into the new home and I’m once again adding content to the blog at least a couple of times per week. Look for an announcement beginning the contest in late August or very early September. My apologies for the delay. Otherwise, enjoy your summer! Keep on printing, and keep on playing! I was wondering about the radio silence. Glad to hear everything is going well. Congrats on the new house. A dedicated game space is super awesome and I hope you enjoy your new space as much as I enjoy mine. 🙂 You’ll have to give us a tour after its all set up! Take your time getting things moved and we’ll be here when you get back. Thanks for bearing with me, Michael. If I weren’t completely exhausted, I’d be totally stoked about the new place. I’ll definitely share pics or possibly video of the game bunker once it’s presentable. Oh, by the way…I have already finished the first Christmas in July post and scheduled it to post tomorrow morning, so more content is actually on the way!